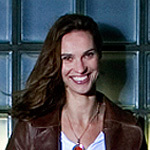 Jolein Baidenmann is the owner of ISDuurzaam, a project and consultancy firm in the area of sustainability, CSR, modern organisation and international cooperation. She graduated in 1996 from the University of Utrecht in the area of International and European Law. Jolien has been interested in politics and social development ever since she was young. She was politically active, including Niet Nix (movement around Felix Rottenberg) and was involved in globalisation. Since 2005 she has specialised in Corporate Social Responsibility, a field in which she pursued a post-master degree at Erasmus University. She was portrayed in 2009 as one of the eight ‘inspirational idealists’ in a book of 45 inspiring Dutch persons sharing a vision of a better world. She is the role model in the ASN bank campaign for a fresh outlook on sustainability. Jolien is currently working on her book about the modern organisation.